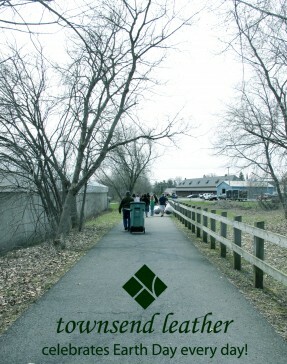 Townsend Leather has taken great care to implement best environmental practices to protect our planet. Our leather is sourced from suppliers located primarily in countries in Europe. The hides are already tanned and the tanning process is strictly regulated in the European Union to assure minimal environmental impact. These hides are reclaimed from the waste stream of meat production. Once hides arrive at our manufacturing plant in upstate New York, they are dyed and finished. Townsend continually invests in production equipment to reduce chemical consumption and emissions by more than 30%. Vegetable-based re-tanning agents are used, as well as water-based finishing systems. Effluent waters are monitored and pretreated before they leave our factory to remove any compounds that do not meet strict state and federal standards. This water receives additional purification in a state-of-the-art waste-water treatment plant engineered to meet the needs of the leather industry, assuring complete environmental compliance. Our cutting program also reduces hide waste. All hides are utilized to the fullest and even leftover scraps are used and recycled to make small leather goods. The cutting program also reduces packaging and weight, thereby reducing shipping costs. Townsend Leather also encourages a company-wide commitment to green initiatives as part of our “Green Team” to find ways to reduce waste and energy usage as well as to recycle paper, cardboard, plastic and glass, and we have even installed energy efficient products at our manufacturing facility. Because leather is a durable and long-lasting natural material, it can be repaired instead of replaced. Leather also typically lasts four times longer than fabric or textile coverings. Just like leather, which stands the test of time, we want our environment and planet to remain healthy for future generations.